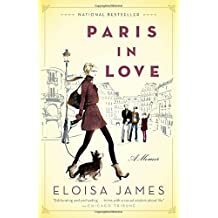 Don't worry---I'm not recommending some cheesy romance novel here (though the author, Eloisa James, is well known among romance readers for her work). This is a fun set of vignettes from Ms. James's life in Paris with her family a few years ago. And, I was relieved to find out, the author herself is not built like a bean-pole or a Vogue model, which idea you might get from the cover, but is just a normal mother of two, on sabbatical in Paris with her husband. and kids. The stories were originally blog posts, which is charming in itself, because you know they were written in the moment, or in the evening of the moment. You know how hard it was being an 11-year-old girl in school with mean girls and teasing boys and difficult teachers? In this book we get a double dose of that, as Ms. James's daughter Anna is going through all that, in Paris, in an Italian-language school. (And Ms. James and her husband are also going through all that, dealing with the teachers and administrators, and of course dealing with Anna's deliberately "forgetting" to bring her recorder home to practice it every night, "because I might lose it." But that's not all. If you go to the door one morning to receive a package from the building's gardienne, dressed in your pajamas and with your hair not combed because you've been working on a deadline, you know that every other tenant in the building will have heard about it by that evening. You might be surprised at how many "mediocre" restaurants there are in Paris, "without a tourist in sight as an excuse." On the other hand, you will find some great and inexpensive restaurants, fun places to visit with children or on your own, the best (and worst) shopping places, and a couple of recipes for your own homemade fine-restaurant dishes. You can get a "Used, Very Good" copy of this very cheaply on Amazon, and I recommend that you do. That's how I got my copy, and how I'm getting two more copies to send to people I think will enjoy the book as much as I did.